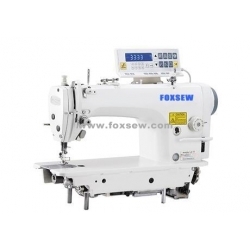 Applicable to Common sewing , medium-heavy materials. Knitting wear, shirts, suit, leisure wear, jeans. FX-9000D is a direct drive high speed automatic lockstitch sewing machine controlled by computerized servo-motor. 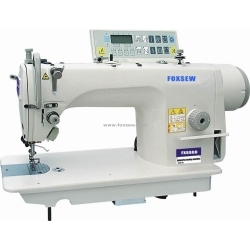 It has the function of automatic thread trimming, auto reverse sewing, auto needle positioning and auto needle swapping besides common capability. 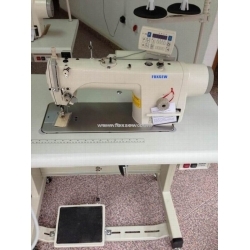 When sewing work is finished, it will automatically cut the upper and lower thread to keep products tidy and beautiful. 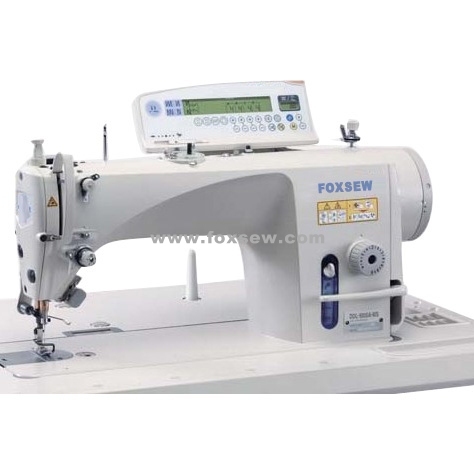 Auto reverse sewing available (including stitch number counting) when set to sewing or stopped sewing. And needle bar is able to choose positioning model (upperor lower). Auto thread swapping available when cut. All the function mentioned are controlled by latest digital processing unit DSP. Auto needle add, auto self check, auto warning to ensurethe safety and reduce the work intensity, increase the efficiency up to 30%. Synchronous driven system to ensure steady power shift, low noise and low vibration to ensure the precise power shift. The pick up structure uses sealed lubricate grease axis to eliminate oil leakage. Sealed oil box reserve box for rotary and needle bar, embolism pump use long cotton thread to ensure mini oil supply to needle bar and rotary to ensure enough lubrication and eliminate oil leakage. New designed model, safe and environmentally friendly, smart and efficient.